DNAOS support current common User Interface technologies, including standard Web-based with HTTP, HTML, CSS, ECMAScrip, JSPs, Servlets, Applets, Flash, etc. DNAOS also manage GUI component and query resources, that save time and effort by automating design operations and helping to structure, manage, and secure interface components. In portals, usually, there can be quite a few GUI components to manage. 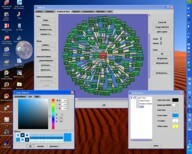 These DNAOS components are also referenced and processed by DNAOS layout management services. Web-based interfaces today are quite rich and undeniably practical and ubiquitous. Administrators and architects managing and modeling rights in complex, and evolving environments, users, services, and resources, especially in collaborative enterprise environments, are required to analyze, process, transform, and share large volumes of sophisticated information, requiring more powerful client applications as well as communication and collaboration between client and server applications. For rich client applications, DNAOS support RMI, JMS, EJB, JINI, JSR-168, Flex/Flash, .NET and SOA interfaces. To support portals and distributed applications and because the SOA interface is open, standard, flexible, and powerful, DNAOS also provide rich SOA distributed network applications (DNA) administration and graphical virtual profile and resource modeling client applications for administrative, architectural, and operational DNAOS work. DNAOS also provide XML-based command-line and batch interface as tools mostly for (usually local) content and system developers and managers.